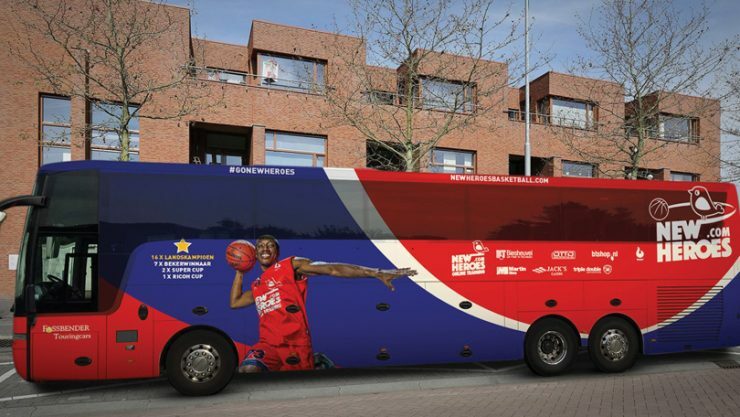 The New Heroes basketball team’s bus features Keshun Sherrill (BA ‘17). Keshun Sherrill ended his college basketball career as the all-time leading scorer in Peach Belt Conference history when he beat the then-record with 2,333 points scored. Sherrill had an amazing collegiate basketball career including being named an All-American by the National Association of Basketball Coaches and the NCAA Southeast Region Player of Year. But would he go pro? It wasn’t long before Sherrill signed to play professionally for New Heroes basketball team in Den Bosch, Netherlands — over 4,000 miles away from Augusta. Upon arrival to Den Bosch, it took Sherrill about a month to get settled in; and not too long after that, he became the face of the team’s bus wrap. And when it comes to others following in his footsteps, Sherrill hopes to motivate.